The Polish Arts Club of Youngstown is proud to announce the schedule for its 83rd Annual Scholarship, Art, Music & Tea Reception. It will take place on Sunday, February 10, 2019 from 1:00-4:00pm at The Butler Institute of American Art North. The elegant afternoon will include the scholarship awards ceremony, a historical introduction to Polish Composer Stanisław Moniuszko by Dr. Ewelina Boczkowska, YSU Associate Professor of Music History and a musical performance of the composer’s work by accomplished Cleveland pianist and violinist Konrad Binienda and Konrad Kowal, respectively. An exhibit of graphic opera poster art from the Polish School of Posters will complement this program. A traditional high tea with homemade cookies will follow. This annual event is free and open to the public as a community service. Musical selections will be provided by two renowned Polish American performers. Pianist and composer Dr. Konrad Binienda is a graduate of the DMA program at the Cleveland Institute of Music. Since his debut with The Cleveland Orchestra in 2007, Binienda has performed in recital and with orchestras throughout the United States and Europe, winning acclaim for his highly individual and probingly musical performances. Konrad Kowal started studying violin at the age of four and is currently working towards a BM and MM in Violin Performance at the Cleveland Institute of Music. Prior to coming to Cleveland, he performed in the Chicago Youth Symphony Orchestra giving him the opportunity to play at Orchestra Hall, Symphony Center and Millenium Park as well as to enjoy a tour of China in June 2014. 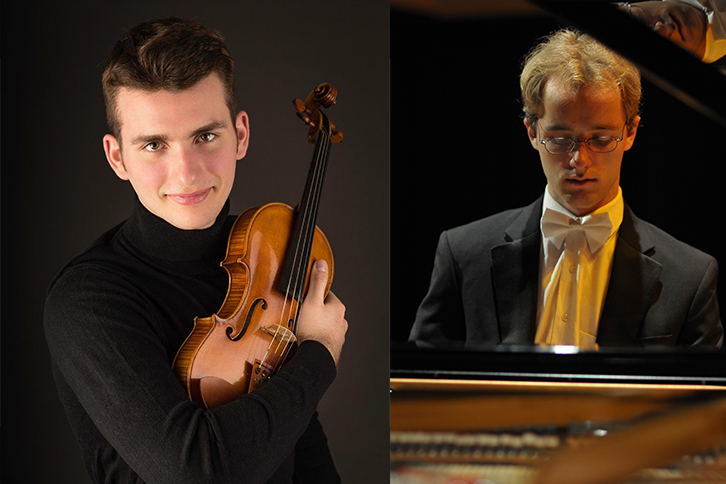 The two men will perform a program of classical pieces by Mozart, Mylnarski and Polish 2019 featured artist Stanisław Moniuszko. The Sejm of the Republic of Poland (the lower chamber of the Polish Parliament) declared 2019 to be The Year of Stanisław Moniuszko – renowned composer, conductor, and teacher. Commonly referred to as “the Father of the Polish National Opera,” Moniuszko (1819 –1872) is best known for his major works: “Halka,” “The Haunted Manor,” and “Paria.” In addition to composition, he was a conductor, organ player, educator, director of Warsaw’s Teatr Wielki. The source of Moniuszko’s melodies and rhythmic patterns often lies in Polish musical folklore. Apart from operas, he composed chamber pieces, religious songs and patriotic music reflecting the history of the former Polish-Lithuanian Commonwealth. Considered an exemplary patriot, the hope is that by shedding light on his life and rich legacy, that modern day Poles and Polonia will be inspired to draw inspiration from their country’s culture, history and identity. Visually illustrating his work will be an exhibit from the Polish School of Posters. Before the era of globalized entertainment made theatre and movie posters look the same in every country, the Polish artists were creating their own versions for the internal market. Using strong and vivid colors from folk art, they combine printed slogans, often hand-lettered, with popular symbols, to create a concise inventive metaphor. As a hybrid of words and images, these posters created a certain aesthetic tension.